The Beta Lab at the Amsterdam University College is a facility that allows undergraduate students to perform many interesting experiments with equipment such as EEG devices, eye tracking and emotion recognition software. Students from courses on Communication & Cognition, on Psycholinguistics and on Information Visualization have worked in the lab for practical assignments, and it has also been used for several advanced students' individual projects. I worked for Dr Sennay Ghebreab as the assistant for this lab for three years (2010-2012). My responsibilities were to operate the lab, maintain the hardware and website, develop software to facilitate student experiments, and to guide and assist students in the execution of their experiments and the analysis of their data. 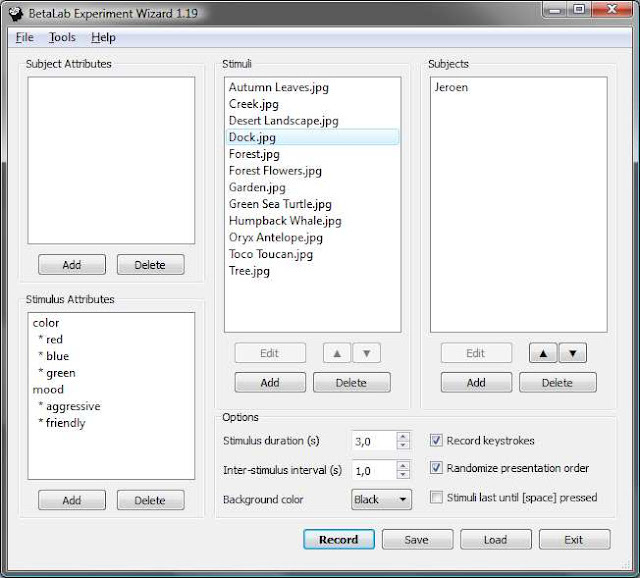 The screenshot above shows the Experiment Wizard, an application I have developed for use in the Beta Lab (freely available, see below). It allows users to prepare and describe audio, image and video stimuli, and to present these stimuli to a subject while EEG and eye-tracking data is being recorded. The recordings and, if required, user responses, are synchronized with the stimuli and recordings are processed and saved in an accessible Excel format. The software is intended to introduce students at freshman level to neuroscience experiments, while keeping math and programming requirements to a minimum. It could just as well be useful for more experienced users. The Emotiv EPOC EEG device. The raw signal transmitted by the EEG device is converted by a Fourier transformation to alpha, beta, delta and theta wave magnitudes, as is common in neuroscience. The eye tracker outputs point-of-gaze locations as pixel locations on the screen. And if neither EEG cap or eye tracker is connected, the software can still be used to record keyboard responses to stimuli. 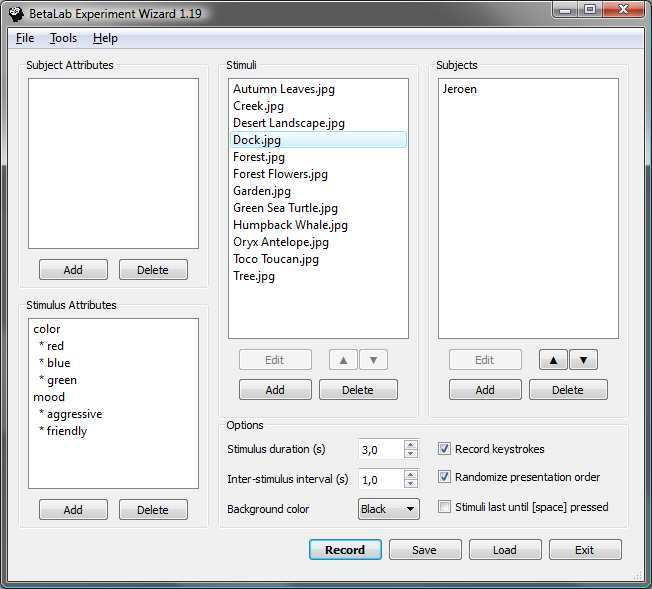 Experiment Wizard is free software (GPL 3.0) and can be downloaded from the link below.